Anyone who has ever read a biography about Walt Disney may remember that he didn't believe in sequels. He looked the other way when audiences demanded them for his earliest animated features, however this principle was abandoned when it came to his live action films. If something was successful and a sequel was feasible, it was done. 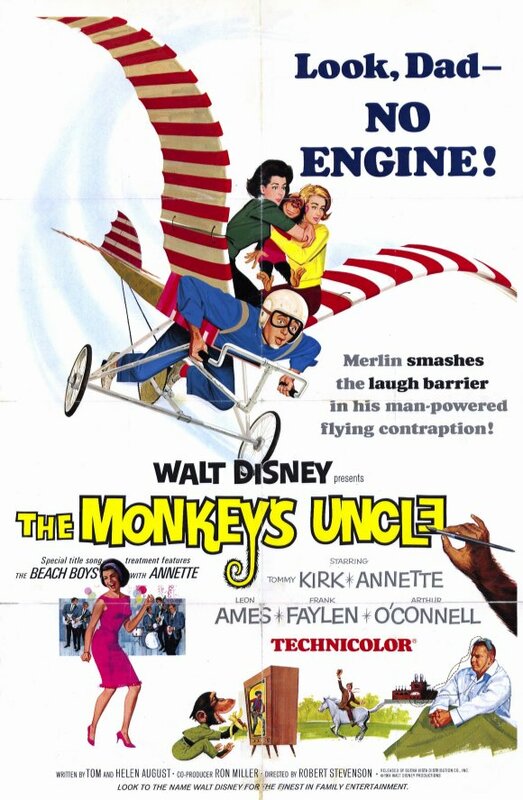 Such is the case with The Monkeys Uncle, sequel to the surprise 1964 hit The Misadventures of Merlin Jones. Nearly everyone involved with Merlin Jones returned for the sequel. Husband and wife screenwriters Alfred Lewis and Helen Levitt returned to write the script, again under the pen name Tom and Helen August since they were blacklisted from Hollywood for alleged associations with the communist party. Disney's go-to director Robert Stevenson, who had just finished production on Mary Poppins, returned to direct the sequel. Contracts for both Tommy Kirk and Annette Funiccello ended with Merlin Jones, but both returned to star in the sequel, marking their final appearance in Disney films. Supporting cast members also returned, including Leon Ames, Norman Grabowski and Alan Hewitt. Lost in Space star Mark Goddard makes his film debut in a supporting role. The Sherman Brothers wrote the title song, which is sung by Annette and The Beach Boys. They also wrote another short song sung by Annette called "I Can Fly." The film opens with a Midvale College party as Annette and The Beach Boys sing the title song while the credits play, after which we find Merlin Jones in court attempting to adopt Midvale's chimpanzee Stanley for a science experiment. The judge grants him conditional ownership and dubs him "the monkey's uncle." He uses recordings while Stanley sleeps to teach Stanley to act like a human. When the school's football team is brought under scrutiny for possible cheating, Judge Holmsby tries to save the team by using Merlin's same sleep learning techniques on the athletes. When the athletes answer exam questions exactly the way Merlin does, they are accused of cheating. However, during an interrogation they are able to prove that they didn't cheat and football at the school seems saved, until a wealthy man offers to donate one million dollars to the university if they will cancel the football program. An even wealthier financier offers them ten million if a student and turn his grandfathers human flying idea into a reality. Merlin Jones is given the assignment and after scaring off one of the athletes from being his pilot, he creates an energy drink that will give him the power to fly his machine. The financier is so impressed that he doubles his offer and gives the school twenty million dollars. However, it turns out the man is actually an escaped mental patient. The Monkey's Uncle premiered on June 23rd, 1965 and went into wide release on August 18th. It was paired with the animated short Freewayphobia. Critics were kind to the film, recognizing it as a fun escape from the summer heat. However it wasn't as successful as the previous film. It was shown on the Wonderful World of Color in 1967 and debuted on home video in 1986. As a sequel The Monkey's Uncle recaptures the fun spirit of its predecessor and comes close to almost being a better film. While this one also has two separate stories that make up a feature length film, they are connected much more cohesively than before. There is a Disney in-joke in one scene where Stanley pretends to study a text book that actually holds a Mickey Mouse comic hidden inside. Viewers with a keen eye may notice a redressed set from Mary Poppins. Mr. Bank's study has been redressed as an office at Midvale with different wallpaper and window treatments. There are also many scenes filmed on the backlot's residential street. The Monkey's Uncle is currently available on DVD as a Disney Movie Club Exclusive. The film is presented in fullscreen, although it was originally shown in a widescreen aspect ratio of 1.75:1. There aren't any bonus features. It is also available on iTunes, where it is presented in widescreen and can be purchased in HD.